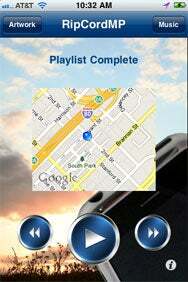 RipCord Music Player is the sort of app you hope to never be in a position to use to its fullest. Stay Alert: RipCord Music Player features large buttons for controlling music playback; you can either display album artwork or look at a map that pinpoints your location. Developer AquilaCom designed the $3 iPhone and iPod touch app with this sort of scenario in mind: A person goes out for a late-night jog, accompanied only by a playlist stored on her iOS device. If she happens to find herself on a dark and empty street where she’s approached—or worse—by any shady looking characters, she can turn to RipCord Music Player. Ripping the headphone cord out of the audio jack of her iPhone will trigger a loud alarm. If that doesn’t deter any would-be perpetrators, the app also sends out an emergency e-mail or text message to friends and loved ones, listing the exact location of the trouble spot. It’s a clever, potentially life-saving idea for an app—assuming a number of circumstances are working in the user's favor. For RipCord Music Player to work, you have to keep the app open and have headphones plugged into the audio jack when the app launches. From there, you’re free to listen to music stored on your iOS device, you can also see your movements tracked via GPS. If, at any time, the headphone cord is ripped out of the jack, a loud alarm sounds, and the app fires off an e-mail to your emergency contacts. While the application comes equipped with a standard emergency message ("EMERGENCY ALERT: I may be in danger and need immediate HELP! "), you're able to customize the content. You can enter up to three contacts; the alerts can also be converted to SMS messages, though there's a bit of a process to setting that up. Visually, RipCord Music Player is clean and simple. Three large buttons for controlling media take up the bottom of the screen, and a display for album artwork or watching GPS movements fills out the rest. The background graphic is an iPhone in front of a sky at dusk. As a music player, the app works flawlessly. The biggest potential problem with this app is not really one of RipCord Music Player’s making. Rather, it’s the fact that a lot of ideal conditions have to be in place for the app to be a life-saver. If you’re low on battery life—and using GPS can drain a battery—you risk running out of power when you need it the most. You’ll need a network connection if the app is to send out that emergency message; what if you’re in an area with poor network coverage or (for iPod touch users) no Wi-Fi? It’s also no secret that location tracking on the iPhone can be a little off some times, and in an emergency situation, your location needs to be as exact as possible. And of course, for the app to be effective, your emergency contact needs to be checking e-mail whenever that alert comes through. It's also worth noting that RipCord Music Player doesn't offer any followup options in the event that the headphones are accidentally removed. Failing to get a hold of all the contacts immediately after such an occasion could certainly be cause for some unnecessary panic. Again, most of these aren’t circumstances RipCord Music Player can control, but they’re worth keeping in mind. As clever as the app may be, it’s no silver bullet when it comes to keeping you safe. When you’re in a risky situation, being fully aware of your surroundings—not preoccupied listening to music—is going to be a much more useful survival skill than any piece of technology.